So here is a little secret. I have a love affair with Portland, OR. I don’t know why. Truth is, I’ve only been there twice, but if you were to say there was a job available up there for both Chris and I next week, I’d drop everything and start packing. There is something about the perfect combination of city, suburbia and rural that I love. It’s not as busy as Los Angeles or Orange County, but not too suburban and cookie cutter like my hometown in Connecticut. And if you drive 20 minutes in any direction, you are in the mountains, at the river, in the middle of a farm, or on a vineyard. Literally amazing. The first time we went up to Oregon we were going for Chris’s cousin’s wedding, but ended up making a trip out of it. We spent a lot of time with family and the rest of the wedding party and at the end of the trip ventured off on our own to get to know the city. The wedding was gorgeous. Set up high on a mountain, overlooking amazing grape vines with Mt. Hood off in the distance. It was beautiful. Me, of course, I remember the food. 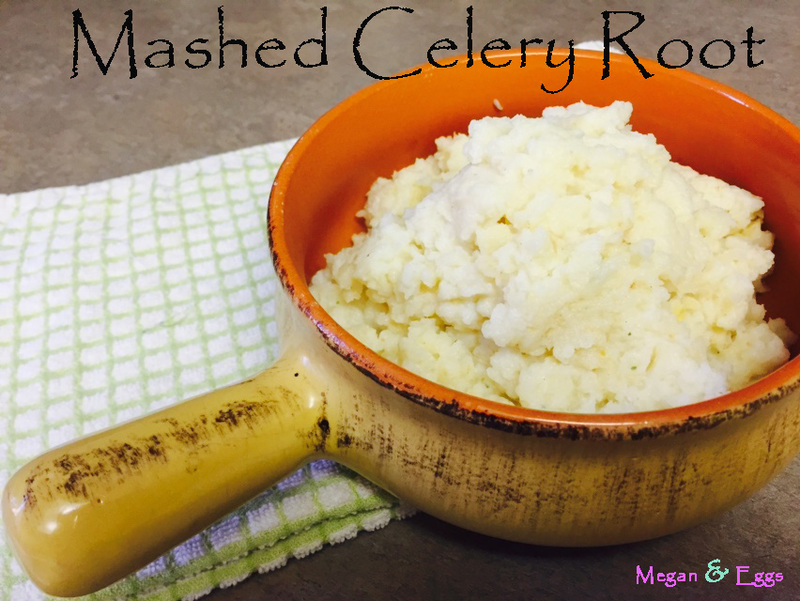 Chris and I both had a delicious, creamy celery root mash as our side and both fell in love. It was the same consistency of a mashed potato if it was pureed… a lot, but it was light like a cauliflower puree. For the past three years we kept saying we need to try to recreate that & of course, never did it. I mean where to do you find celery root!!? Until I asked the produce guy at our local supermarket. There it was, just two in the entire store… but they were there, hidden with the other root veggies. Who would have thought?! So I bought them and began experimenting. 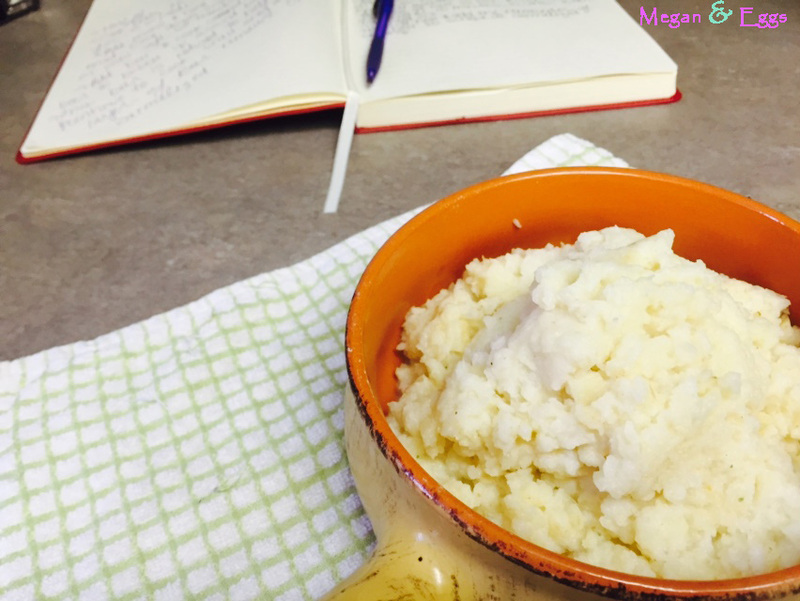 I like a little texture in my sides so I left this a little more mashed then the celery root that we had at the wedding but it’s simple, quick and tasty. Try it out, enjoy! 1. Chop off the stem of the celery root. Now flip root upside down so it is sitting flat on the cut side. Carefully peel the outside of the root off of the middle and discard. 2. Dice into 1 inch squares. 3. Place celery root in pot and fill with water about 2 inches above the root. Salt water and bring to boil. Boil for 20-30 minutes or until root is tender, like you would with a potato. 4. Drain root and return to hot pot. 5. Combine all ingredients and mash with a potato masher. For a smoother finish use a electronic mixer.